SAN FRANCISCO--(BUSINESS WIRE)--A new survey from Compliance Solutions at Charles Schwab finds the role of the compliance officer is evolving and growing in scope across corporate America. Among those compliance professionals surveyed, 80 percent feel their role is valued within their firm and nearly two-thirds (62%) believe they have influence over corporate decisions. The survey also reveals a need for more tools designed to help compliance officers do their jobs more efficiently and effectively. Only half (51%) of compliance professionals are very confident that their employee monitoring policies are effective in achieving desired results. On average, compliance officers spend approximately 11 hours per week monitoring and surveilling their employees’ personal brokerage accounts. 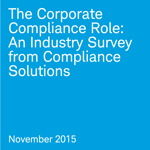 Half of compliance professionals also monitor social media. In the past 12 months, 49 percent of compliance officers have taken action against an employee for failure to follow the firm’s code of ethics, with 11 percent of those actions resulting in termination. The average respondent spent only 1.92 percent of the year on his or her own personal development. 54 percent of compliance professionals are still using some form of manual compliance surveillance, and 21 percent are primarily dependent on a manual review of paper statements for their employee personal trading account surveillance. 34 percent say they spend a disproportionate amount of time collecting data rather than analyzing it. 80 percent of those who utilize automated compliance surveillance are confident in their technological solutions. Compliance professionals feel that their biggest challenge is the increasing responsibility for non-traditional compliance activities, such as information/cyber security or third-party vendor reviews. This is closely followed by the difficulty of keeping abreast of recent changes to laws and regulations. 43 percent said that their highest priority over the next 6 to 18 months is testing and auditing, followed by streamlining compliance programs (39%) and monitoring and reporting (38%). Cyber security ranks as the top priority in terms of future investments, as 32 percent of compliance officers believe this will be a major focus in the near-term. “An ever-evolving regulatory landscape is clearly at the forefront of companies’ concerns over compliance. However, this has long been an issue,” Rister said. Today, businesses face another consideration as cyber security has become a serious threat and social media puts everything on display and engenders a 24/7 news cycle. This constant conversation, and this never ending shining of the spotlight on business practices, means brand evaluations—and possible repercussions—happen in real time. “Even alleged noncompliance can result in swift adverse business effects, such as decreased sales, decreased productivity, reduced share price, and reduced brand value, all putting a company in serious jeopardy. In this environment, a highly effective compliance program is not just a business advantage, but also a business necessity,” Rister concluded. From August 12th through August 26th 2015, Penn Schoen Berland (PSB) conducted 134 online surveys among compliance influencers. Compliance influencers consist of individuals who work in financial services or at a firm affiliated with money management who have influence over decisions regarding compliance issues within their organization. Interviews came from both the Schwab-managed database and from a PSB-provided panel sample and for this study Schwab looked at aggregate results from both sample sources. Detailed findings can be found on our research page. Compliance Solutions empowers firms with a comprehensive suite of automated employee monitoring solutions, designated brokerage services, and a wide range of financial products and services for employees. Formed in 2012, Compliance Solutions monitors approximately $60 billion in total assets and consists of Schwab Designated Brokerage Services and Schwab Compliance Technologies, Inc. (formerly Compliance11, Inc.). Schwab Designated Brokerage Services has provided employee trade monitoring services to employers in regulated industries for more than 20 years and now serves 1,600 corporate clients covering 250,000 employee accounts. Schwab Compliance Technologies provides advanced, web-based compliance tools and technology to more than 685 corporate clients and 97,000 licensed system users. Compliance Solutions consists of Schwab Designated Brokerage Services (DBS), a division of Charles Schwab & Co., Inc. ("Schwab"), and Schwab Compliance Technologies, Inc. ("SchwabCT"), formerly Compliance11, Inc. Schwab Designated Brokerage Services provides brokerage solutions for corporate clients who monitor their employees’ securities activity. SchwabCT provides technology solutions for corporate clients to help facilitate their compliance technology program implementation. Schwab Compliance Technologies, Inc. and Charles Schwab & Co., Inc. are separate but affiliated entities and each is a subsidiary of The Charles Schwab Corporation. Penn Schoen Berland is not affiliated with Schwab, Schwab CT, or the Charles Schwab Corporation. Brokerage Products: Not FDIC Insured • No Bank Guarantee • May Lose Value. A new survey from Compliance Solutions at Charles Schwab finds the role of the compliance officer is evolving and growing in scope across corporate America.